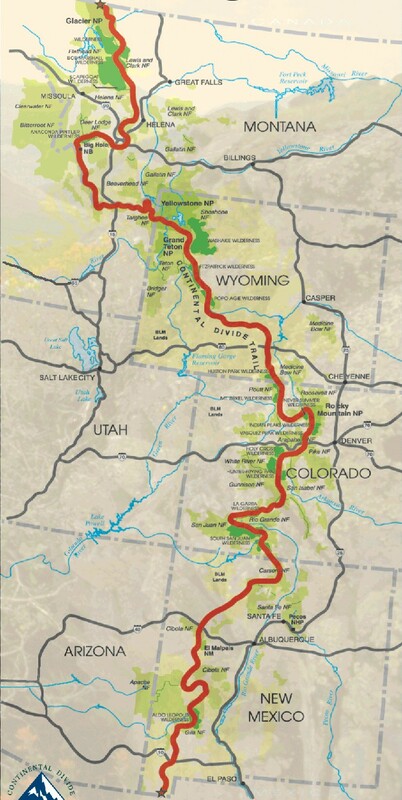 I hope to hike the Continental Divide Trail in the near future. Since it's right down the middle of the country, maybe someone would like to join me? Distance 3100 miles - trail reroutes happen so this is an estimate of the trail length. Total Elevation Estimates vary depending on the elevation sampling sizes taken, but the generally accepted number is around 450,000 feet gained over the length of the trail. This is the accumulated elevation from climbing up to passes and ridges and down to valleys and streams. Terrain Desert with high daily temperatures and low night temperature in New Mexico. Very high altitudes over much of the trail, the highest national scenic trail. Scarce or non-existent trail markings much of the way. History Designated into the National Trails System in 1978. It is about 70% complete in 2011. Challenges No hi-traffic, groomed trail like the AT - on the CDT you have to find your own path much of the way. Travel and camping on snow and ice with high wind and low oxygen. Time Window Most start around April 1st going northbound - leaving too early means high snow in Colorado. Southbounders leave in mid-June - earlier and the high snow and deep river crossings may stop you. Time to Hike Typically takes about 180 days, averaging 17 miles per day. Expect lower daily averages than AT and PCT due to elevation, wild terrain, and tougher navigation. Permits Back country permits required in Rocky Mountain, Yellowstone, and Glacier national parks. Thru-hiker Tally Historically, about 30 attempt a thru-hike each year, but that number is steadily climbing year to year. In 2014, almost 2 dozen people completed the trail. @Berty - I've planned on saving the CDT until I'm more experienced since it's about the most rugged, remote long trail in the country. Now that I've done a few long treks, I'm ready for it whenever the stars align. Of all the trails, it's the one I would really like to have a companion on since chances are pretty low of running into fellow hikers out there. I thru-hiked the CDT southbound in 2015. Popularity is booming and about 180 people attempted a thru-hike my year. Of the 30 of us who hiked southbound, about 20 finished. We had much better luck than the northbound folks in terms of snow. The CDTA fell apart a few years ago, but we're lucky to have the new leadership of the CDTC! I would like to walk the trail, but would like a partner. I am in pretty good shape (from doing farm work this past year). But I havent done any long distance wilderness hiking before. @Dave - Before you set off on a 100+ day trek, I hope you find time to do a few shorter trips with your gear to develop skills and ensure you've got the equipment you need. Planning on Thru-Hiking the C.D.T this coming April-May, decided to hike nobo. This will be my third long distance hike, and triple crown. 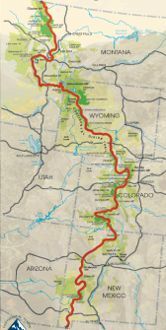 Planning to thru hike the CDT in 2018 going southbound. Anybody else with the same plan wants to partner up? @Juan - Best of luck on your CDT trek! I don't have any long trek planned for 2018 yet. If you want to tell me more about what you're doing, you can Send me Email. I'd like to hear your plans.